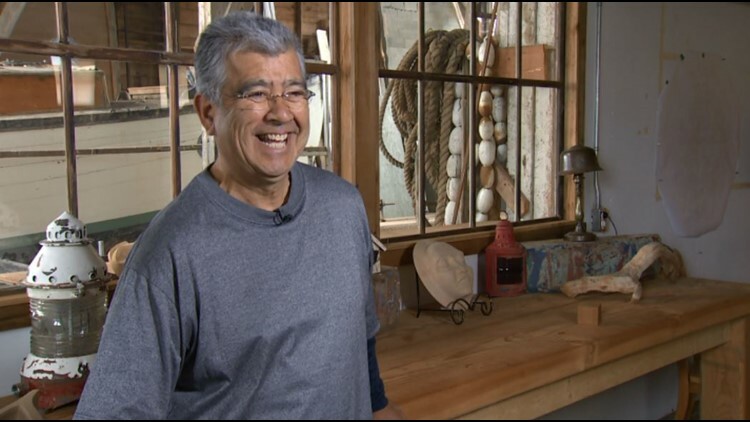 COWICHAN BAY, BC — First Nations artist Arthur Vickers found his purpose at 42 years old when he paused on the way to his construction job to watch the sun rise over Mount Baker. "When you find your purpose, as my grandfather would say, put everything you have into it." That was the moment he decided to become an artist. He turned that moment into art. "And the scene of Mount Baker with the sun rising is exactly what I saw that day." The work hangs in his Cowichan Bay gallery - a screen print that transforms when the light hits it, revealing an eagle in the sky. The work tells the story of what happened to Vickers that day: he saw an eagle perched in its nest, watching the same sunrise. For a moment, Vickers and the eagle shared the transformation of night into day. Vickers grew up in the village of Kitkatla off the coast of northern BC. His grandfather - a canoe maker - taught him how to carve. He works in wood, paint, ink, even gold leaf, and his gallery is also a work of art, a light-filled boathouse built in the 1800s. Vickers doesn't reveal how exactly he creates his color-saturated prints that magically transform. He doesn't talk about how he carves wood so precisely, making cuts that curve just so, with hand tools. The artist keeps that between him, and his art. He does reveal that he only carves wood from trees that have died or been blown down. Giving new life to ancient wood is work he doesn't take lightly. “You really only have one chance to bend a board and steam it and bend it into a box shape. Trust me it is terrifying no matter what no matter how many times I've done it." Each of Arthur Vickers' creations does seem to have a life of its own. He's just helping to tell their stories. This story brought to you by Tourism Cowichan. Evening celebrates the Northwest. Watch weeknights at 7:30 on KING 5 & streaming live on KING5.com. Contact: Facebook, Twitter, Instagram, Email.